In a sign that value oriented hedge fund managers are continuing to wade into the depressed offshore drilling sector, David Einhorn’s Greenlight Capital has reported a 5.2 percent stake in Ensco plc as of June 30, 2010. Mr. Einhorn controls 7.4 million shares with a market value of slightly over $300 million at today’s closing price. 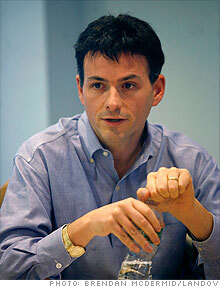 This represents a substantial commitment for Mr. Einhorn’s funds which were valued at $2.93 billion as of March 31. It appears that his purchases were definitely made in the second quarter, and most likely were made after the Deepwater Horizon disaster. We have profiled two companies in the offshore drilling sector over the past six weeks: Ensco and Noble Corporation. Click on the links below to read the analysis and follow up articles. Both companies remain good selections today for investors who seek exposure to the offshore drilling sector and are willing to look beyond the temporary difficulties associated with the Gulf of Mexico oil spill and the Federal Government’s regulatory response. Disclosure: Long Noble. No Position in Ensco. Your blog is a resource for high quality research. As a novice to investing, I have learnt so much from your contributions. I sincerely appreciate your effort. If you ever plan on starting a investing firm, not exclusive to high net worth individuals, count me in ! Thanks for the comments on Einhorn. I wonder why he selected Ensco rather than one of the others in the industry.